There are some wrong impressions about the Igbos in Nigeria that I wish to address. Talking about some misconstrued insinuations such as the Igbo man like too much money that he cannot do without it, the Biafra agitators preaches hate and that the Igbo man is the problem of the South-South. All these came from what Sir Ahmadu Bello referred Nigeria as the mistake of 1914! To begin with, let me make it very clear by stating categorically that am not "Igbo", rather am a "Biafran", but am from the Igbo-speaking part of Biafra but Igbo is not my identity. I carry the tag of "great" which was only accosted to one country in Africa by the British. Let me extensively disintegrate without sugar coating or compromise, this long overdue lies of all times with facts and figures. My resounding attention have been drawn to this "hate speech" for long that I started asking who and who is preaching hate? Sometimes most of our younger generations have refused to sit, study, research and digest the happenings in this country called Nigeria whose foundation was cemented with lies with the concept of deceit coupled with divide and rule propaganda. Unequivocally, I will appreciate it if our youths can take a trip back to history before amalgamation to understand were all these deceits, crimes, pains, failures and problems began from inception till it reached this unbearable stage. With statistics, I will unravel my slated points of assertion which Nigerians have closed their eyes to and refused to accept in good fate. But I don't expect the least from them. First, let me begin to dispel this wrong notion that the Igbo man likes too much money more than other tribes in Migeria and that they hate other tribes. I hereby ask with solitude, can anyone name the former presidents, senators, and so on that have looted Nigeria right from onset? Explain how they have exhibited patriotism to Nigeria. After a critical look at the list of looters who have stached money away in foreign banks, you will realize the tribe whose penchant for money theft have overdriven the collective interest of the citizens. Abacha— $28bn, IBB— $6.25bn, Ahmadu Bello— $3.1bn, Atiku— $500m, Abiola duped Nigeria $200m, Ismaila Gwarzo— $1.03bn, Umaru Dikko—$4.5m, Gen. Ishaya Bamayi— $200m, Bashir Dalhahi— 3m, Abdulkadir Abacha—$1.2b, Mohammed Abacha— $1.2bn, Alhassan Adamu— $300m, TY Danjuma— $700m, Rabui’ Kwankwaso— $100m, Babatunde Fashola— $900m, Sule Lamido— $100m, Alhaji Wada— $1.32m, Sanusi Lamido Sanusi— 1.2bn, Ahmed Bola Tinubu— $6bn, Abdulsalami Abubakar— $9bn. Was it an Igbo man that siphoned Biafrans’ money in the banks and gave them only 20 Pounds? Is that not hate? Who are the real thieves here? Secondly, Sir Ahmadu Bello made this statement, and I quote, "the new nation called Nigeria shall be an estate of our great grandfather, Uthman Dan Fodio. We must ruthlessly prevent any change of power. We must use the minorities in the North as willing tools, and the South as conquered territories and never allow them to have control over their future." These were the words of Sir Ahmadu Bello. Is that not hate? Now coming to those who goes about with the mere propaganda that Igbos are the problem of the South-South, when I hear this from these individuals, I ask why is there no West-West or North-North? It sounds stupid jumping the inhabitants of river Niger which is Anambra to name people living near the Atlantic Niger Delta. I must reiterate when they call everyone in the former Eastern region Igbos. Our languages varies even in the East but it is still called Igbo. Usually Gowon (if u watch Biafran documentries) will say that they are the same people, they are Igbos! Now, those who always claim that the Igbo is the problem of the South-South should tell me if it was an Igbo man that orchestrated the Odi massacre in Bayelsa? Are the Igbos the ones killing militants fighting for their right? Are they the ones sucking your crude oil to Kaduna, and leaving ur home deserted? Was it an Igbo man that killed Ken Saro Wiwa and others? What about the Warri, Calabar, and Port Harcourt Seaports where you must go and clear your goods in Lagos while yours is been used by Dangote, was it the Igbos that shut it down? Are the Igbos in charge of Agip, Isopadec, Police, Army, civil service in your area? Was it an Igbo man that caused lack of international airport in the South-South and Southeast region? Are they the ones killing your brothers in the North and staging all roads in the East with military camp? 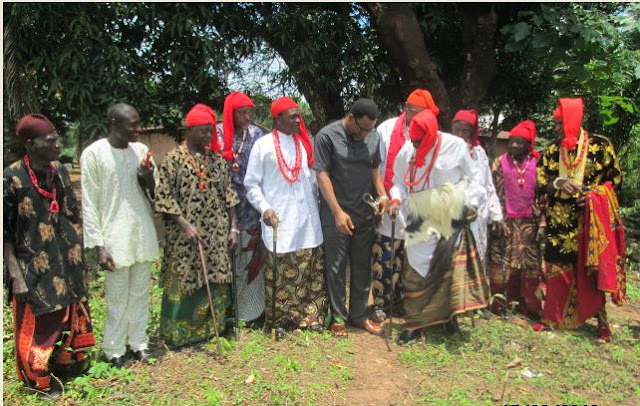 It is undeniable that the Igbo man remains independent to anyone. He possess an unsubdued minded talent and brain behind Nigeria's development. The quest for survival brands them unmatched with the West or North. All anyone can do is deny but can't change the fact that out of nothing he create something to make a daily living. Give him a forest and get a Japan in return, give him a wood and you will get a furniture in return. You can glorify or vilify him but what u can't do is hide the truth. Now we want Biafra. We want Biafran warriors as our own National football team. We want our own women team. We know we will survive with nothing because our God lives, He is the one that fed the Israelites in the wilderness. If anyone believes that the Igbos are constituting problems in Nigeria, then they should let Biafra go in peace so that Nigeria won't be disturbed again. That will help her to progress without prejudice. We want freedom, give it to us. Pharaoh let my people go. Allow them go to their promise land. Give me liberty or give me death. I hope the people of the world that have ears can hear that We are no longer interested in this unwanted union and continued existence of the British contraption called Nigeria. All we ask for is the freedom of Biafra, and the release of our leader, Nnamdi Kanu. nothing more nothing less. "give me liberty or give me death"
Yes that is what we are clamoring for. FROM THE BIAFRAN RABBI.I WOULD HAVE LOVE TO SEE YORUBAS LOVE SAME PEOPLE THEY CALL SOUTH SOUTH BUT SAME HATRED.I WOULD HAVE LOVE TO SEE HAUSA-FULANI LOVE SAME PEOPLE THEY CALL SOUTH SOUTH BUT SAME HATRED. YET,DUE TO SLAVE MENTALITY OF THE ELDERS IN WHAT YORUBA/HAUSA-FULANI CALLED 'MINORITIES' IN OLD EAST,THEY SOLD OUT THEIR GENERATIONS DESTINY TO YORUBA(AWOLOWO)AND HAUSA-FULANIS BUT THANKS TO THE NEW GENERATION LIKE THE DOKUBOS AND LIKES WHO UNDERSTOOD DEMONIC PLANS OF YORUBAS ESPECIALLY AND ISLAMIC NORTH(THE BIAFRAN OIL GAME).THANKS TO GOD AND THE ZIONISTS SAVIOURS OF BIAFRALAND WHOSE MANDATE WITH GOD OF ABRAHAM IS TO LIBERATE IGBOS AND ALL BRETHREN WITHIN AND OUTSIDE FOR A BIAFRAN RESTORATION PROJECT.WE SHALL OVERCOME AND THE SHAME REMAIN WITH SATAN AND ALL HIS CORRUPT AGENTS IN YORUBALAND,HAUSA-FULANI ETC.AGAIN,WE SAY:BIAFRA SHALL BE FREE FROM ALL HER ENEMIES AND AGENTS WITHIN US SHALL BE DISLODGED AND CORRUPTION SHALL BE OVER. BIAFRA IS GREAT AND GOD HAS MADE IT SO.#BIAFRA OR DEATH#ISRAEL RISING IN WEST AFRICA. URS THE BIAFRAN RABBI.